If air conditioning is a consideration to you, then we may have something of interest. Your business could be eligible for a grant towards the installation costs of Air Conditioning. The Business Energy Efficiency Programme (BEEP) is available throughout Worcestershire offering FREE energy assessments and grants to small and medium sized enterprises (SMEs). Grants from £2,000 to £20,000 available to help you lower your energy bills! Open until 31st March 2019 on a first come first served basis. If you currently use oil, gas or electric as your main source of heating you could be eligible for a Grant to switch to Air-to-Air Heat Pump (air conditioning) technology. With the FREE added benefit of cooling in the warmer months! 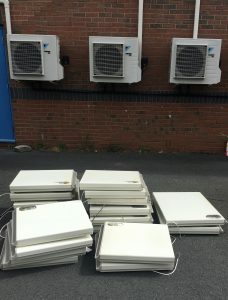 One customer replaced their electric heaters with the latest model of energy efficient Daikin R32 wall mounted air conditioning systems. Their energy efficiency has vastly improved when heating the premises with the added bonus that they now have cooling for the warmer months – which they didn’t have before the project. Grant activity examples: Renewable Technologies, lighting, Insulation, Compressor, Heating & Boilers. For the full list please visit www.business-central.co.uk/beep/ where you can download a BEEP Registration and Assessment Form. Alternatively for more BEEP Grant information and details of how apply please contact the BEEP team on 01905 677 888 or email info@business-central.co.uk. We hope that you have found this information useful, all information correct at time of publication. Young Air Conditioning has previously worked on projects that have benefited from the BEEP grants and felt that our customers would find the above information of interest. Young Air Conditioning does not receive commission from the Business Energy Efficiency Programme we are only forwarding information for our customers to consider. We have linked to other websites, but we can’t be responsible for their content. Reference: Information wording, BEEP and ERDF Logos courtesy of Worcestershire Business Central.